Once upon a time brides would cherish their wedding dresses long after their big day, keen to pass them onto their daughters so they could wear them for their wedding or even just as a keepsake of one of the happiest days of their lives. But as with anything, traditions change and people move on. Instead of preserving a beautiful white gown in a box hidden away in the attic that they know they’ll never wear again, brides are following one of the latest and most unconventional wedding fads: trash the dress. 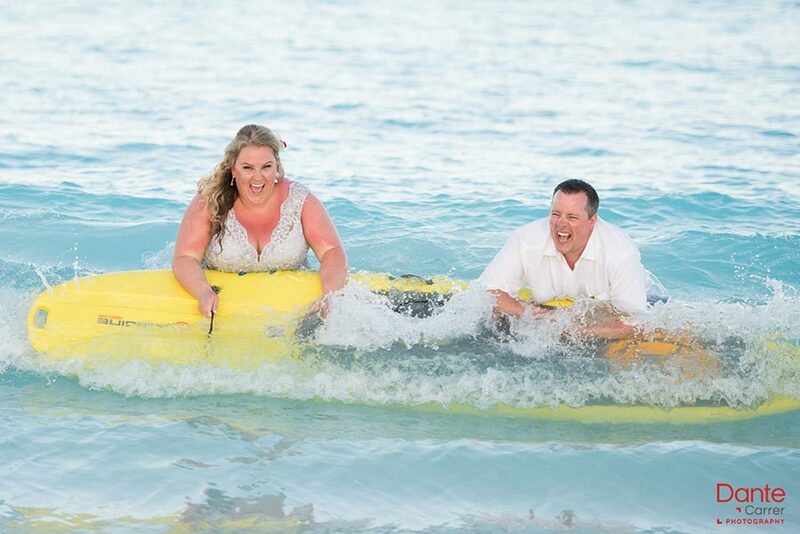 Also referred to as “fearless bridal” and “rock the frock” trash the dress means pretty much what you’d expect. Shortly after the wedding day, the bride gets back into her white gown, visits a generally grubby location to contrast with the elegance of her outfit and proceeds to ruin her dress, or at least mess it up a bit, while her wedding photographer clicks away. All with the aim of creating pretty-ugly pictures that wouldn’t look out of place on the cover of Vogue magazine. Although it sounds like a one-off trend that would disappear as quickly as it showed up, trash the dress photo shoots have actually been around for more than a decade. Most sources agree that trash the dress pictures started trending fairly recently in 2001, when Las Vegas wedding photographer, John Michael Cooper, got bored of shooting traditional wedding scenes and convinced open-minded new brides to pose in grungy offbeat settings, submerge themselves into lakes or light themselves on fire, all the while wearing their gorgeous white gowns. “In fashion photography, they often put really pretty people in very ugly places. I’m applying that technique to weddings,” he said during an interview with the New York Times in 2007. But if you look deeply enough, you can argue that the American movie industry has been using trash the dress symbolically since at least October 1998 in the movie Sunset Beach, when Meg Cummings (played by Susan Ward) was filmed furiously running into the ocean in her wedding dress following the unanticipated interruption of her wedding. It might not have had the glamour of today’s trash the dress pictures, but it made a big impact all the same. Is trash the dress just for the bride? Even though the trash the dress concept (and if we’re being honest, wedding photography as a whole) is generally centered around the bride, there are plenty of ways the groom can get involved in trash the dress, too. While you’re unlikely to see a male-only version of a trash the dress photo (Trash the tux? Slash the suit?) it is common to see both the bride and the groom in trash the dress pictures, with both parties destroying their wedding outfits together. When planning a trash the dress photoshoot in celebration of a wedding, having both the bride and the groom get involved can be really powerful and uniting, much more so than if the photos were of the bride alone, which can sometimes come across as angry and even revengeful, depending on the setup. If you’re looking for inspiration on how to get the groom more involved in trash the dress, you’ll find it tricky to find much more than the odd photo which features the groom online, since most photographers put the bride at the front and center. But don’t worry, we’ve got your back. Scroll down a little bit and further on in this article you’ll find plenty of ideas of how to get involved in trash the dress photos as a groom and as a couple. Why would anyone trash the dress? With the average American bride spending almost $1,500 on her wedding dress, you might wonder why on earth anyone would choose to trash the dress. It’s not only a small fortune you’ve spent to get it. Most brides spend weeks trawling through wedding dress shops with their mothers and bridesmaids, determined to find the perfect gown. And when they do, they’ve still got to go back to the store again and again for fittings and adjustments before they’re finally able to wear it in front of their friends, family and groom. After all that hard work, surely you’d want to keep the dress forever and ever, right? Well, not everyone feels so sentimental about their wedding attire. When you get married, one thing’s pretty much certain: you’re never going to get to wear your wedding dress ever again. Unless you get re-married and your next husband has no issues with you re-wearing your old wedding dress. But since that’s pretty unlikely, most brides agree that instead of having a dress sat in the attic gathering dust, they’d much rather get another use out of it and what better way to do that than that with trash the dress photos? On her wedding day, a bride has to spend the entire day being all prim and proper, but a trash the dress photoshoot is the exact opposite of that. Instead of being told that she has to behave correctly and ladylike, in a trash the dress photoshoot she can be as rebellious and messy as she chooses. After months of stress planning a wedding, being able to let your emotions run free and do whatever feels best is a great release. If you’ve ever looked through someone’s wedding photos before, you’ll know they can be a bit same-old, same-old. You’ll see the same groups of people, same poses, same scenery… No matter how beautiful the couple and how talented the photographer is, there are only so many ordinary wedding photos you can look at before you have to start stifling yawns. But imagine if you got to the end of the photo and saw a trash the dress pic with the bride swimming in water in her beautiful ivory dress or stood in the middle of a muddy field wearing it. You’d start paying attention then! You don’t have to take trash the dress pictures straight after your wedding. Some couples keep the dress for 12 months and then bring it out for a photo session on their first year anniversary. A trash the dress photoshoot is guaranteed to make your anniversary way more memorable than a night at a restaurant or a piece of jewelry ever could and it will help you remember the magical day you celebrated together one whole year ago. Trash the dress photoshoots aren’t always the happiest of occasions. The trend that began as a way to celebrate marriage has also been adopted by a group of women who you could argue it should have belonged to the whole time: divorcees in their 20s. Although a trash the dress divorce photo and a trash the dress wedding photo might look identical, they’re significantly symbolically different, the former of which often showcases destroying the dress much more passionately, harshly and permanently. But this kind of trash the dress picture isn’t intended to hurt anyone. It’s simply a way for a woman to get over her unsuccessful marriage, accept it’s ended and move on. Just like there are two sides to every story, there are also pros and cons to trash the dress. So if you’re in two minds about whether or not you should have trash the dress pictures taken, consider these three things before you pick up your phone and call your photographer to arrange a post-wedding shoot. Today, couples spend an average of $26,645 on their wedding in the US and one of the easiest ways to get at least a small percentage of that money back is by selling the wedding dress. After all, you’re never going to wear it again and there’s a huge market out there for brides looking for affordable second-hand dresses. So a handful of trash the dress photos are essentially costing you hundreds or thousands of dollars, depending on how much you paid for your gown, plus the price you have to pay your trash the dress wedding photographer. There’s no way to sugar coat it: trash the dress is wasteful. Even if you’ve got more money than you know what to do with (lucky you!) and you don’t need to sell your dress to get some cash back, you could still donate it to someone less fortunate who can’t afford a wedding dress. So much work, time and skill goes into making each and every wedding dress that it’s almost a tragedy to see one destroyed beyond help. Traditionally, wedding dresses are something that get passed on through generations and generations. Even if your daughter or granddaughter would never want to wear your bridal gown in a million years, it’s still a very emotional and important reminder of who you were when you were younger – a person they never got a chance to meet. This hand-me-down takes on even more importance to your family down the line after you pass on. Could you really deprive your descendants of that deep connection to you, your past and their family history? Where do people trash the dress? The beach is by far the most popular place to have a trash the dress photo taken. 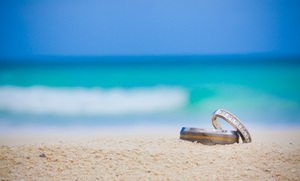 Whether that’s because destination weddings are becoming increasingly popular or a beach location allows you to tie the photoshoot in with your honeymoon, trashing the dress on the beach is becoming so common it’s practically cliché. 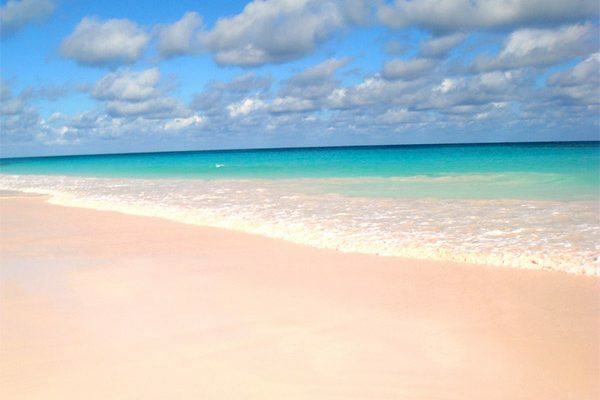 At Sandy Toes, we offer a few bahamas wedding packages that you can plan the perfect day at a private beautiful beach with many locations to ‘trash the dress’. For brides who can’t make it to the beach, the second most popular place for a trash the dress picture is the water. A lake, a river or even a large pond creates the perfect environment for a bride to loat elegantly on the water’s surface or take on a mermaid-like persona underneath. Naturally dirty environments with plenty of grass and mud, like farms, fields, forests and parks, also make ideal locations for trash the dress photos. Not only are these types of places naturally photogenic, but they also allow the bride to get involved as much or as little as she likes. She can stroll through the sun-dappled forest and lie down in the lush green grass or jump in a huge muddy puddle and ride a horse. The options are pretty much endless! Essentially, trash the dress photoshoots can take place anywhere. The above are the most common locations, but basically anywhere a bridal gown would look out of place is the idea. Sat next to some locals in a bar, on a bench in the middle of the city, next to some graffiti in a scary part of town, climbing a tree like you used to as a kid. 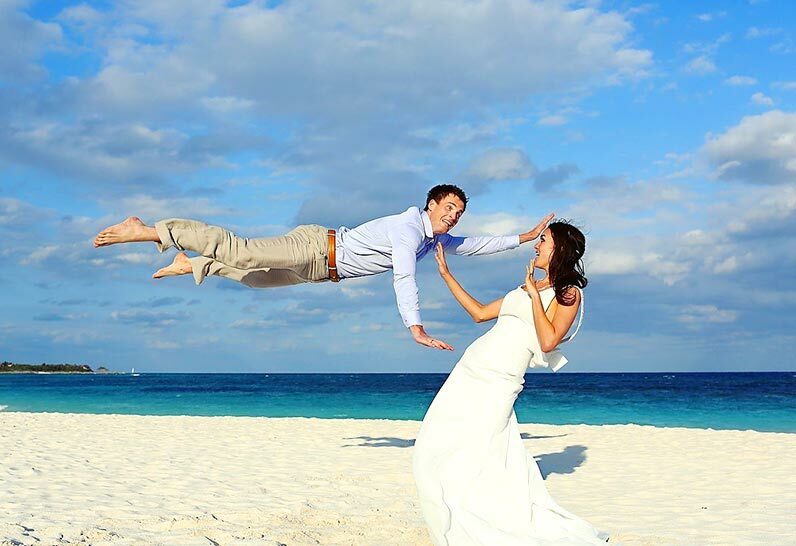 There are literally no limits when it comes to where you can trash the dress. Go for a walk on the beach: kick off your shoes and feel the sand between your toes as you walk along the soft, golden beach. It’s even more romantic if you can time it so your walk is at sunset. If you’re not entirely sure you’re ready to give up your wedding dress just yet, you should be able to find someone who can clean out the sand and get it looking as good as new when you’re done. Make snow angels: this one’s perfect for winter weddings. Simply lie down in a snowy patch and start making snow angels! Make sure you get an awesome photographer who’s quick to get the perfect shot because you won’t want to be rolling around in the snow for too long in a flimsy dress. This is another great option if you want to salvage your gown after your trash the dress pictures..
Bring out the bubbly: save two bottles of champagne from your wedding then shake them up and spray each other with the fizzy bubbles. This looks so beautiful when it’s done on the beach during the daytime but you can really do it anywhere you like. Take the plunge: you dove straight into marriage, now’s the time to take the plunge into the water. Find a reasonably high cliff, hold hands and take a leap of faith into the blue waters below as the photographer snaps away. 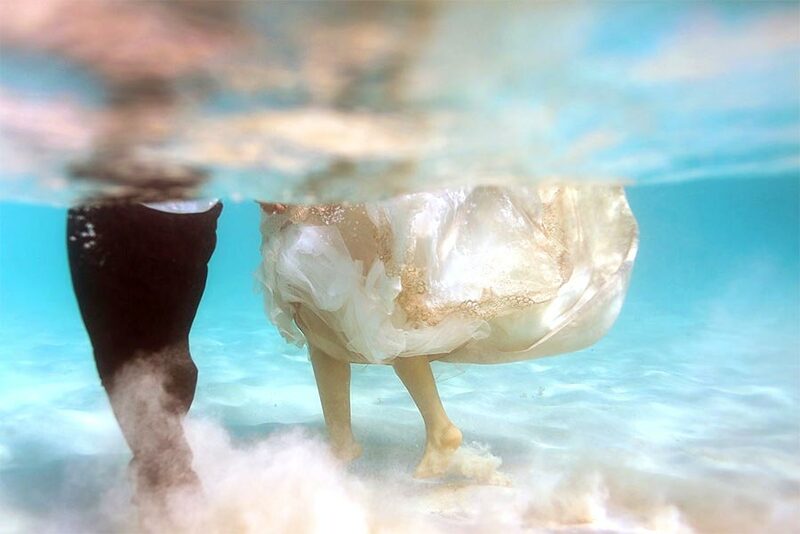 If you can hold your breath, you’ll get some wonderful shots if you do an underwater trash the dress photoshoot, too. Stand under a waterfall: climb up onto the rocks and get ready for the icy cool waters to cascade over you and your wedding gown. You’re guaranteed to look confident, cool and glamorous beneath the powerful spray. Just make sure there’s someone standing nearby with the warm fluffy towels you registered for. Make a new friend: If you’re an animal lover, show how much you really care by visiting them in your bridal gown. Whether you stop by a petting zoo, visit an animal sanctuary or pop into an adoption center, the dirty little paws might make a mess of your dress, but you’ll have a great time along the way. And you might even make a new friend for life that you take home with you! Roll in the grass: you probably did it plenty of times before you were married, so what’s stopping you now? You can cuddle up in a grassy field together or for a more fun and childish take on the theme, challenge each other to a race and roll down a grassy hill to see who gets to the bottom first. Drink to your dress: red wine is one of the toughest stains to get out, but when you’re trashing the dress, that doesn’t really matter. Make a toast to your wedding with your partner then give him permission to pour his glass of red over you. The contrast of deep merlot against pure white will look incredible. Take a mud bath: if you were ever told off for playing in the mud as a kid, now’s the time to get some revenge. Grab your groom, wait for a rainy day then splash in as many muddy puddles as you can find. Pick up a few handfuls of wet mud and fling them at each other if you’re really feeling it! Throw some paint around: powdered paint isn’t exclusively for religious celebrations, it’s also a fun way to trash your dress. Pick up the paints in every bright, fluorescent color you can find then throw them at each other until you can’t even tell what color clothes you were wearing in the first place. Have a food fight: get together with the groom (and anyone else from your wedding party you’d love to have in your trash the dress pictures) and get ready for the ultimate food fight. If you’ve got leftover food from the wedding buffet, this is a great way to use it up! Become a work of art: know someone who’s into art? Then stand in front of a canvas and get them to paint a masterpiece with you as part of it. This works best with graffiti-style spray paint artwork or paint splatters where the paint ends up everywhere. Go paintballing: the long gown might slow you down a bit, but that shouldn’t stop you. Don your protective gear (safety first!) then go paintballing with your new husband. When you can’t take any more, take off your mask, helmet, gloves, etc and have the photographer take photos of you both covered in colorful paintball splats. If you’re totally sold on the idea of trash the dress, but don’t really want to destroy your beautiful wedding gown you saved and saved for, here are some alternatives you can try for the trash the dress feel without actually, you know, trashing your dress. One of the easiest solutions is to buy another dress. Not another full-price bridal gown, but a second-hand wedding dress, a cheap wedding dress online or even a long white prom dress. This way you’ll be able to look the part in your trash the dress photos and still get to treasure your original dress. Have you seen the trash the dress photos where it looks like the bride is setting herself on fire? Well you need to know something about them: they’re Photoshopped. If your wedding photographer knows his way around the photo editing software (or knows someone else who is) you can take home amazing trash the dress pictures that will really wow people for hardly any effort on your part. Plus, your dress will stay as perfect as the day you wore it down the aisle, although the photos will definitely suggest otherwise. You don’t have to totally wreck your gown when you trash the dress. There are plenty of ways to get incredible photos by only getting your dress a little wet or dirty. Most decent dry cleaners (or even washing machines, nowadays) will be able to get a bit of sand or dirt out of the hem of a dress, so don’t worry about getting a little grubby. The start of our trash the dress ideas list has plenty of ways you can pose for stunning photos without ruining your gown for life. 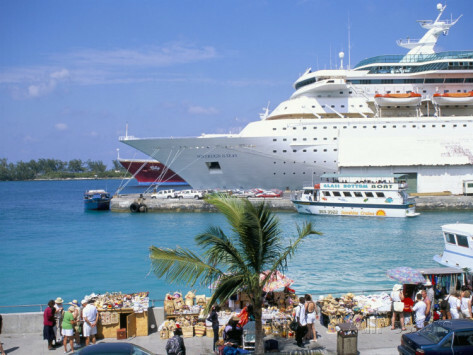 Take a look at our bahamas wedding packages for more information.